On July 18 I announced the start of a 'special project' on this blog. It is called the 'The Presentation Code.' The purpose is to study all kinds of presentations and arrive at the DNA of a presentation. One code which is common to all presentations. If we get to know this DNA we will know how to champion every presentation. What happens in every presentation? Let us give these stages codes. 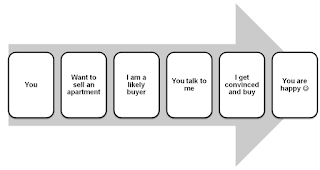 Sales presentation made by a sales manager: You (the sales manager) want to sell apartments (stage A). You are looking out for buyers. I am one of them (B). You come to me and tell me about the apartment. You tell me about its strategic location and affordable cost. Don't all of them say the same thing :) (C). I buy it (D). You meet your objective (E). If I don't buy, you catch another prospective buyer and start all over again. Quarterly Business Review Presentation by marketing manager: Your job is to grow market share and make good profits for your Dento-Sento toothpaste brand. Every quarter you have to make a presentation to your CEO on the progress. She reviews your work, your achievement versus your target. You want to impress your CEO and share with her how hard you have worked in the last quarter (A). On your CEO's review depends your career (B). You go prepared for the meeting with all statistics and reports (C). Your CEO shares her feedback (D). You are able to impress the CEO (or else start counting your days). This model will fit into other kinds of presentations we well. After all, every presentation is a communication with a purpose. Two lessons to start off with. 1. Every presentation has a goal. The salesman wants to sell, the trainer wants to train and the manager wants to impress. The goal is the most important element of a presentation. We need to 'clearly' define this before we begin to work on our presentation. 2. There are 5 elements to every presentation. (1) First there is you. (2) You want to achieve your goal. (3) You cannot achieve it without me. (4) So you come and talk to me. You tell me your message. (5) After listening and talking to you, I do something. Depending on what I do you either achieve or fail to achieve your goal. These elements are: You, Your goal, Your audience, Your message and The action which your audience takes. Every element is important and needs to be understood and taken care of. In future posts we will build upon what we have learnt today. Till then think about the ABCDE's of your upcoming presentation. Interesting take on elements of a presentation. Thanks Fred. Just trying to dig into absolute basics to see what we can learn.